Boost Pressure Gauges indicate a turbocharger or supercharger's level of boost pressure or manifold air pressure in an internal combustion engine. They can be mounted almost anywhere you want: the driver's side pillar, a radio slot, or in the dashboard. They are used to measure engine driven air compressors that provide varying levels of boost according to the engine's load and rpm. 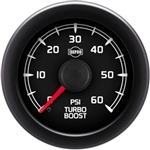 Boost Pressure Gauges are used to ensure that there isn't an excessive amount of pressure being created when the boost pressure levels are modified to levels above the Original Engine Manufacturer (OEM) standard. When using an aftermarket turbocharger in your vehicle, these gauges are extremely important in allowing your engine the long life that it deserves.